The U.S. is declining to take sides between Saudi Arabia and Canada after the Middle Eastern nation's extraordinary reaction to Canada's condemnation of the arrest of a Saudi Arabian human rights activist. State Department spokesperson Heather Nauert said Tuesday that the U.S. raises such issues privately with Saudi Arabia -- and that it is up to the Saudis and Canadians to work this out, but she declined to condemn the activist's arrest. The activist is Samar Badawi, a noted women's rights advocate who was honored as an International Women of Courage Award Winner by the U.S. State Department in 2012. But she's also one of as many as a dozen women arrested in recent months, even as the kingdom's young Crown Prince Mohammad bin Salman has tried to improve the country's image and taken steps to grant women more freedoms -- including drivers' licenses. After pushing to grant women that right -- Saudi Arabia was the last country on the globe to do so -- MBS, as he is known, appears be punishing the very women who led the charge for it. 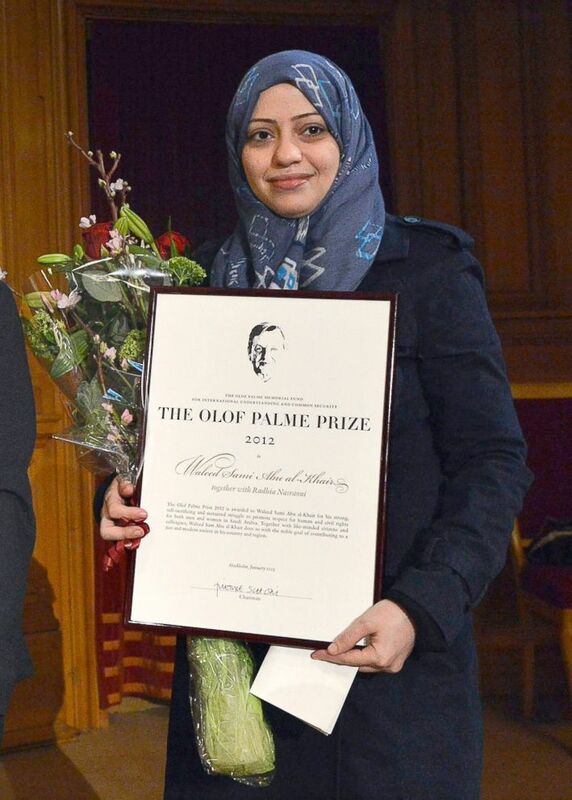 (Anders Wiklund/SCANPIX/EPA via Shutterstock) In this file photo, Saudian lawyer and human rights activist Waleed Abu al-Khair's wife, Samar Badawi, receives the Olof Palme prize at the 2nd chamber of the Swedish Parliament in Stockholm, Jan. 25, 2013. Badawi is also the sister of famed blogger Raif Badawi, who has been jailed since 2012 for his writings that were critical of the government and sentenced to 10 years and 1,000 lashes. Raif's wife Ensaf Haidar and their three children moved to Canada and became Canadian citizens earlier this year. Furious at foreign condemnation, Saudi Arabia immediately took steps to strike back at Canada for Freeland's criticism. The Saudi Foreign Ministry called the criticism "a major, unacceptable affront," "a violation of the Kingdom’s sovereignty," and "a blatant interference in the Kingdom’s domestic affairs, against basic international norms and all international protocols," according to the state-run Saudi Press Agency. The Foreign Ministry also withdrew the Saudi ambassador to Canada and declared the Canadian ambassador to Saudi Arabia "persona non grata," expelling him. "The Kingdom will put on hold all new business and investment transactions with Canada while retaining its right to take further action," the Saudi Press Agency added as well. Saudi Airlines reportedly suspended flights to Canada, and some 12,000 Saudi citizens studying at Canadian universities were being moved to "programs in other countries with similar education systems, such as the United Kingdom," according to the Canadian newspaper the Globe and Mail. But the harsh response didn't end there. A Saudi government-linked account tweeted an image of a plane flying toward the Toronto skyline, with the warning, "He who interferes with what doesn't concern him finds what doesn't please him." The post was later deleted, and the Saudi Ministry of Media, which oversees the account, said the account had been suspended pending an investigation. The Canadians expressed outrage at the overwhelming response from the Saudis, with Freeland issuing a statement saying Canadian "deeply concerned." "Canada will always stand up for the protection of human rights, including women's rights and freedom of expression around the world. We will never hesitate to promote these values, and we believe that this dialogue is critical to international diplomacy," she said. 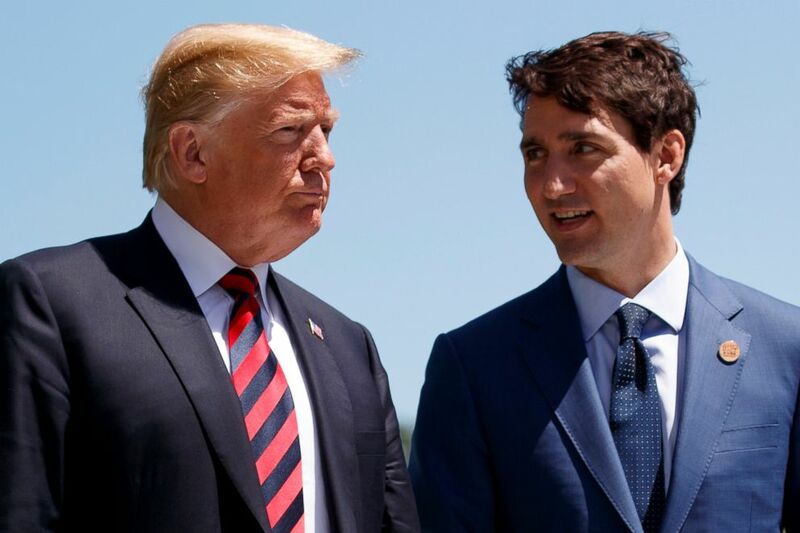 (Evan Vucci/AP, FILE) President Donald Trump talks with Canadian Prime Minister Justin Trudeau during a G-7 Summit welcome ceremony in Charlevoix, Canada, June 8, 2018. While Canada is one of the U.S.'s treaty allies and shares values like women's rights and free civil society, Saudi Arabia has traditionally been referred to as a "partner," given the close economic and security ties, despite differences on issues like freedom of expression and religion. But the Trump administration is not taking a side in this fight. A State Department spokesperson described both nations as "partners" to ABC News Tuesday. "We are aware of Government of Saudi Arabia’s statement recalling the Saudi ambassador to Canada and expelling Canada’s ambassador," the spokesperson said. "Canada and Saudi Arabia are both close partners of the United States. I refer you to the Canadian and Saudi Ministries of Foreign Affairs for further information." Spokesperson Heather Nauert added during a briefing with reporters on Tuesday that the U.S. has raised similar issues with Saudi Arabia. "We would encourage the government of Saudi Arabia overall to address and respect due process and also publicize information on some of its legal cases." Yet when asked to condemn Badawi's arrest, she declined. "Some of these issues we choose to discuss privately with our friends, with our partners, with our allies," Nauert said.